Tonight I'm drinking TNT Weizen Doppelbock brewed by Left Hand Brewing Company in Longmont, Colorado. 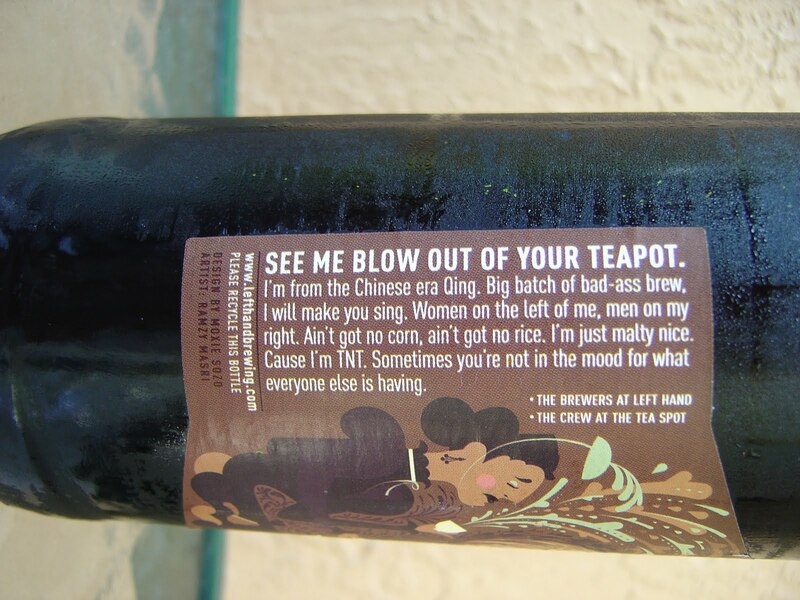 This beer is brewed with Lapsang Souchong tea. The label depicts a couple at a tea party, but the teapots are sinister looking and might be responsible for the tea splashing from each of their glasses. (tough to take a 2D pic from a 3D bottle, but you can see the lady in the picture below). Label design is by Moxie Sozo and the artwork was done by Ramzy Masri. There's a little story that I'll let you read in the picture below. The bottled on stamp on the neck is seriously unreadable, but I think I see an "11" where the year might be, which makes sense. 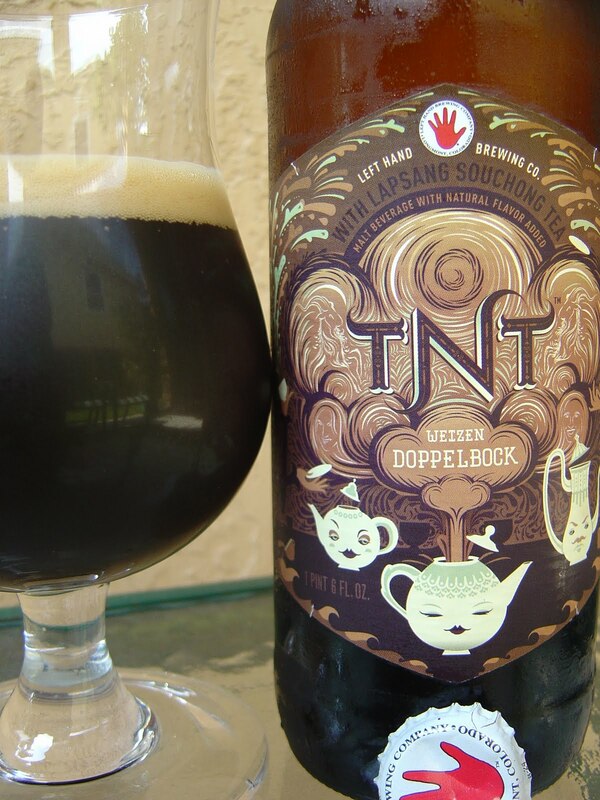 Rich, malty, chocolaty, nutty aroma. Pretty nice. Herbal tea flavors over a thick, malty, sweet pancake syrup. Yep! That's how this beer rolls to start. Next, some seriously smoked caramel and some nuts. Smooth, medium-well body, not so good carbonation. This beer is kinda weird all around--it has this hearty, meaty, savory flavor/consistency that is not very appealing. That combined with icky, thick, sweet, smoky malt jumble and I am not digging this in the slightest. Sorry, I didn't finish all of big 22. Good job looking up the artwork's artist, going to look into it. The smokiness of this beer is too intense for my palate at this point. Sludge. Hey Chris. Left Hand does a good job naming artist on their labels. If you look closely at the bottom picture, to the left of SEE ME BLOW... you can see some dark brown lettering. That's where. As for the beer, I was not a fan either.